Tutorial: Cheaters Guide to a Fancy Dress! I just discovered (months after posting this) that Vanessa at V and Co. had posted almost the same exact tutorial an entire month earlier! I'm a copy cat, and I didn't even know it! Anyway, go check out hers here, it's super cute! 1) I measured it up to another similarly styled dress that my daughter had, and cut off the excess. If your skirt has elastic like this one, make sure you put a pin in the elastic first, so it stays put! If it has a zipper, be sure not to cut that side off. 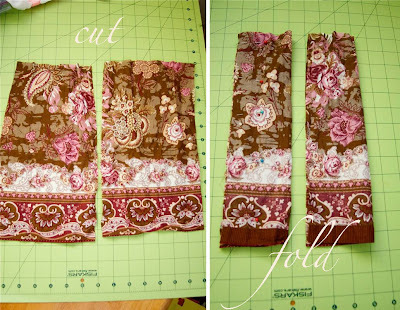 2) Using the part that you cut off, cut two sections for straps, using another of your child's dress as a guide for length. Mine were 7"x12" unfolded. 3) Fold the strap pieces over, right sides together, and pin. 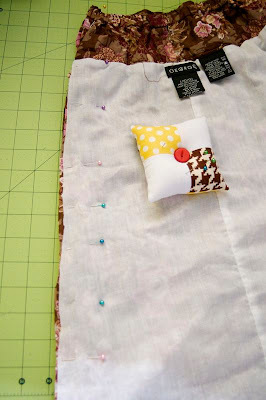 4) Do the same with your dress piece, and sew down the pinned sides of all three pieces. Hem the tops and bottom's of the straps. 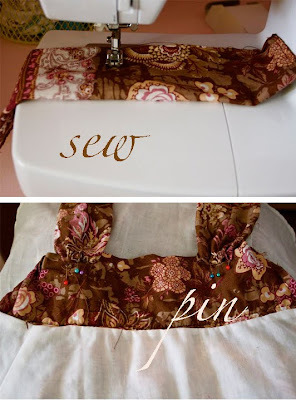 5) Using your machine's gathering stitch, sew along the top, bottom, and middle of the straps. Pull top string to gather in all three places. Then sew a regular strait stitch across the middle gathered section on each strap, to hold in place. 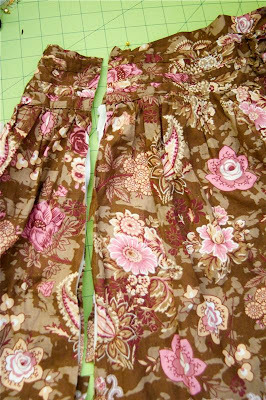 6) Turn dress inside out, and pin straps to the dress, being sure they are not too close or far apart. Sew on. 7) To put in the pick-ups, gather the fabric (by machine, or just by hand-scrunching), then sew back and forth across the gathered part. Do this in however many places you'd like! I did 2 in back, and 2 in front. 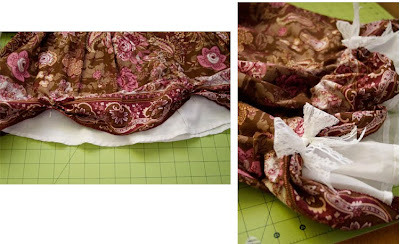 8) Hand stitch on bows, or buttons, and whatever you want. Or just leave them plain, it's cute that way, too! 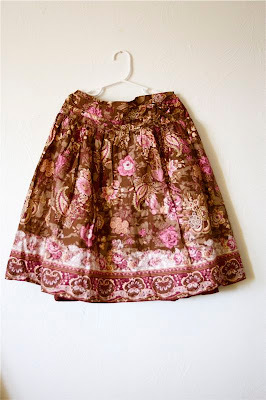 *You could do this for an older girl, too, using an adult sized skirt! So sweet! Adorable photos. Thanks! There is no end to your talent. You are amazing. Thanks for the tute. YOU! are a goddess! 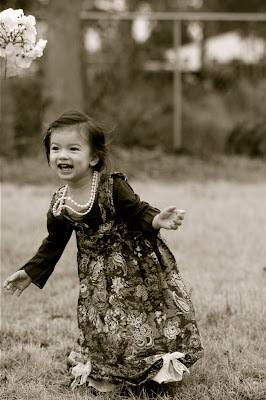 that is amazing...it helps that you have such a gorgeous model to make clothes for :D she is too cute! OMG this is fabulous! I have seen so many gorgeous skirts that I left at thrift store because they didnt fit anyone! Argh.I wish it werent night so I could go buy them. This is amazing! Truly beautiful! THANKS!! can't wait to try it!! This dress is fabulous!! I bet your daughter feels like a little princess in it! Seriously, do you ever stop being a sewing genius? This is incredible. Everytime you post, I should automatically feature it. SO darling. My daughter would love it. Too bad I am not as creative or crafty as you! What a brilliant idea thanks. I'll definately be giving this a go. Your creations are absolutely beautiful as our the photographs! You could open a shop and sell the clothes along with the photographs of all the little ones dressed up! Today is my first day visiting this blog. Bless you and your lovely daughter and family! I am so thrilled about this, Disney! I have been trying to find REAL dress up clothes for Pear to play dress up with and it's so hard! There just isn't anything out there these days (unless you want to pay an arm and a leg). I'm going shopping at the goodwill and am going to convert skirts into "fancy" dresses. I. Love. This. Dress. Could not be cuter! I am a marginal, self taught seamstress at best and I really feel like I could do this. I love that there would be few of my own seams to give me away for the lack of finished looking seams. Then I can coyly say, "Oh this old thing? Whipped it out in an hour." AWESOME! I am loving this dress. I can't wait to find a skirt for my little one! oh my goodness! Ok this is the cutest thing and I WISH I had this before I tortured this skirt I found and tried to make something out of it. This is perfect and now I'm off to find more skirts! I love the style of the things you make. 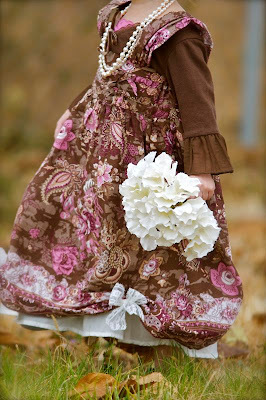 Vintage and so so cute!! I just wish I was as comfortable with a sewing machine as you are! So cute - your blog is very cute. Happy Saturday Sharefest! You are a Very Clever Girl! Oh dear, my housewife skills stretch to opening a jar of pasta sauce...Over from SITS happy sharefest! WoW! So beautiful! Great job. Sewing is definitely not one of my talents. Very nice blog, stopping by from SITS Saturday. This is so gorgeous! 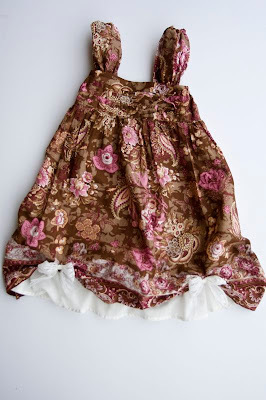 I have an adult skirt that I bought to make my daughter a dress. Now I know what I am going to do with it! I am loving your blog. (Found it through One Pretty Thing.) You have so many incepting things on here. Plus your daughter is cute as all get out! What a creative soul you are!! and what a darling little girl you have! This dress gorgeous! 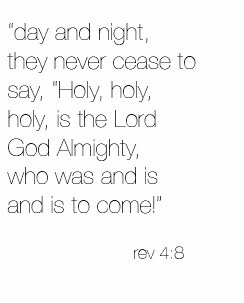 I just found your blog and I am hooked. I love all your projects and your daughter is beautiful. Mom's are just the best, mostly when they get great surprises for dirt cheap! Ya gotta' love'em :) The dress looks great and the tutorial is one that I will be keeping in my stash of "great inspirations". 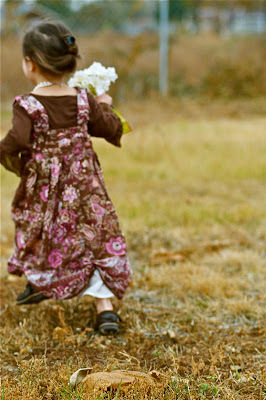 Now, off to find a great skirt to recycle into this cute dress! Breathtakingly beautiful...it looks very expensive, I'm amazed! 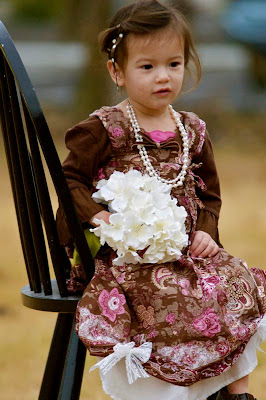 beautiful dress, and what a little doll your daughter is. Does she love taht you make all this wonderful stuff for her? I am a VERY beginning sewer and was wondering if you could tell me how you determined the length of the bodice rectangles? I LOVE THIS DRESS. IT IS AMAZING!! I had got that same skirt from a goodwill. Now I know why it was a little small. They had it in the adult section. I let out some of the elastic and I'm keeping it around cause I liked the fabric. im seriously about to attempt this!! i have two skirts that are just too cute to throw away but i cant wear them anymore!! so i guess my daughter will have two new dresses!! im so excited thanks for the tutorial!! you are amazing!